April Fools Check: Did Google Really Release Mail Goggles? I looked at the blog post and then I looked at the date. No, it’s not April Fools and yes Google did just release a new product, created by Jon Perlow, called Mail Goggles. The new feature, which is a play on the term Beer Goggles (which refers to being so drunk that unattractive people look attractive) has the goal of helping you unsend those crazy drunken emails that sometimes go out late at night and on weekends. 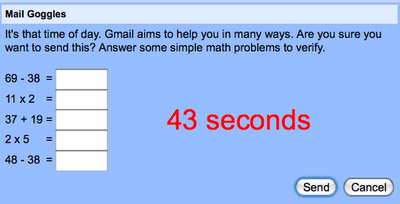 If enabled, Gmail asks to you to complete a few “simple” math problems in a limited period of time before the email goes out. There are two problems with the product. First, I hate math. Second, if I want to send a drunken email, and all that’s standing between me and success are a few math problems, I’m gonna go find that calculator. I send messages I shouldn’t send. Like the time I told that girl I had a crush on her over text message. Or the time I sent that late night email to my ex-girlfriend that we should get back together. Gmail can’t always prevent you from sending messages you might later regret, but today we’re launching a new Labs feature I wrote called Mail Goggles which may help.